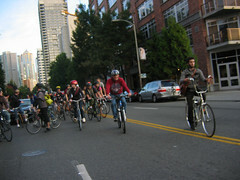 I rode Seattle Critical Mass on Friday, great time and and a nice ride as always. The weather was lovely for a ride, could be the last rain-free mass of the year. We ended up cruising from downtown through Ballard, up Stone way past Greenlake and down University ave. I had to peel off a bit early, would love to hear where the ride ended up. I was a bit surprised at the amount of antagonism between drivers and riders, it seemed quite a bit more than I’ve seen earlier this year. One comes to expect a certain amount of frustrated car drivers, but it really seemed like the level of animosity was on the rise. Next Next post: New York to get Paris style bike rentals?